Toulouse Geese are generally seen in two forms. One is reserved mostly for showing, and the other is used more commonly for meat production. The show form, or Dewlap form, of Toulouse Goose is larger, often weighing 25 to 30 pounds. It has a large dewlap and a deep keel. The other, more common form of Toulouse Goose lacks this dewlap and usually weighs less than 20 pounds. All Toulouse Geese are gray. Their backs are a darker shade, over lighter gray plumage, and their undersides are pure white. The bills of Toulouse Geese are bright orange, as are their legs. The feathers are quite long and most Toulouse Geese have rather loose skin. Some Toulouse Geese have been color bred into white and buff shaded varieties. Because of their body shape, Toulouse Geese should only be kept on relatively flat pastureland. They are quite tolerant of cold and may be much hardier than some other types of goose in cooler climates. Breeding Toulouse Geese will incubate their own eggs if they are allowed to. Often they produce about 50 each year. 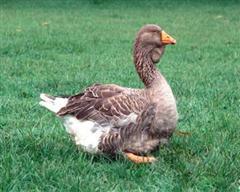 Many people say that the reason large Toulouse Geese are scarce is that they are quite difficult to breed. The smaller type is said to be easier to breed. The beautiful Toulouse Goose is one of the more popular breeds of gray goose, and it is not difficult to see why. Not only are Toulouse Geese beautifully colored and large, but they are also quite docile. Relatively quiet, slow moving birds, Toulouse Geese can best be described as docile and stately. They often do well even when kept with other species of birds. Because of their large size, Toulouse Geese should not be rushed or startled. This can cause injury, particularly in the larger type. A beautiful accent to any yard, Toulouse Geese are normally calm and can be kept in groups. Although Toulouse Geese are one of the more popular breeds of gray goose, their numbers are not particularly strong, especially the larger version of this type. Toulouse Geese are commonly raised for exhibition and as garden pets. Many are also raised for meat. This breed originates around the region of Toulouse in France, though it has become popular in many areas of the world.